Lemurs are small primates, known as prosimians. Classification Status: Many lemur species are threatened with extinction due to habitat loss and hunting. 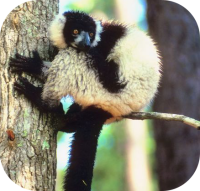 Species: It is believed that at one point in time there were more than 100 species of lemurs, it is estimated that there are approximately 88 species of lemur still alive today. The lemurs are divided into 5 families. 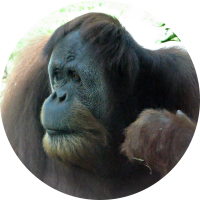 They have a characterestic long bush tail,well-developed sense of smell and often scent mark their territories. 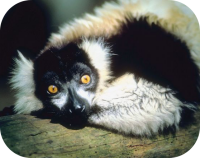 Species that is nocturnal leaf eating lemurs. Larger species of lemurs with spring like legs that allow them to jump up to 30 feet. Species that is solitary and nocturnal with long nimble fingers for grabbing grubs. Species that is solitary and smallest of the lemur species. Size: Lemurs range in size depending on the species. The smallest lemur is the pygmy mouse lemur with weighs approximately 1 ounce. The largest lemur is the indri which weigh around 20 lbs and can measure up to 4 feet tall. Habitat: Lemurs are found only on the island of Madagascar and on the neighboring Comoros islands. 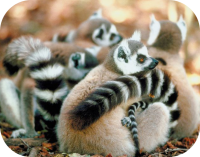 Lemurs are found in a variety of habitats lush rainforests to deserts. Conservation Status: Some species endangered. Senses: Lemurs have a keen sense of smell and they also have good vision, even at night. Behavior: Lemurs species are both nocturnal and diurnal. Most lemur species are arboreal. 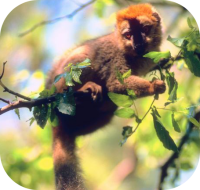 Diet: Lemurs eat insects, fruits, leaves, and other edible plant materials. Description: Lemurs are characterized by a small body, a long nose, and large reflective eyes. Lemurs have opposable thumbs and big toes, that are used for grasping when climbing. Communication: Lemurs communicate vocally, they also as well as through scent markings. The word lemur comes from the word lemures meaning "ghosts of the spirits". Social Structure: Some lemur species are social, while others are solitary. The social lemur groups are dominated by a female.